This afternoon I attended the “Free Gaza” presentation at the Unitarian Universalist Church in Fresno, the presentation that I wrote about last week (“Pro-Hamas activists to speak in Fresno“). About 50 people, mostly church members, attended. The speakers today will tell you that they are fighting for the Palestinian people. But their actual goal is to assist the genocidal Hamas organization. The Gaza Strip is currently ruled by Hamas (The Islamic Resistance Movement) which took control of the area from the Palestinian Authority in a violent coup in 2007. Hamas’ reason for being is to destroy Israel and replace it with an Islamic state. Its methods are the most violent possible. Since 2000, Hamas has murdered hundreds of Israeli civilians by bombings, shootings and rocket and mortar attacks. The ‘occupation’ they talk about is the ‘occupation’ that began with Israel’s creation in 1948, not the 1967 war. The so-called Free Gaza Movement is part of a propaganda apparatus which tries to portray the Iranian-financed proxy war being fought against Israel by Hamas and other extremist groups as a human rights issue. It is not – it is an asymmetric war in which the concept of human rights is cynically used by some of the world’s most intolerant, hateful extremists to try to prevent Israel from defending herself. What you will hear and see today will be a combination of exaggerations, lies, and – most importantly – partial facts presented without context. I followed this with some excerpts from the Hamas Covenant, so everyone would know who Hamas is. The presentation was strange, sort of a throwback to a 1950s anti-communist B-movie. The room was festooned with Palestinian flags, the lectern draped with a keffiya. 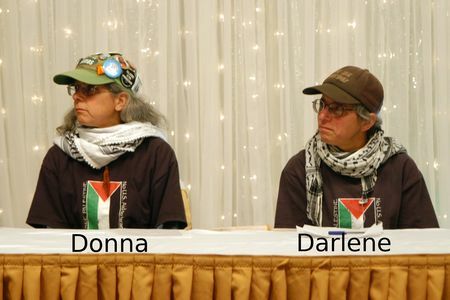 Donna and Darlene were, if anything, more robotic and humorless than their picture suggests. Israel is a terrorist state! Donna and Darlene then proceeded for one hour and 45 minutes to do exactly what I had predicted in my flyer. Mostly they provided partial facts without context. For example, they showed a video of an Israeli patrol boat firing into the water near a Palestinian fishing boat and finally dousing it with a water cannon. Just an example of the sadistic Israelis torturing the poor fishermen, they said. Clearly the explanation was that the Palestinians were testing the limits, and the Israelis were (non-lethally) enforcing them. But the limits are imposed “in order to deny them a livelihood”, they insist. No, there are limits because otherwise the fishing boats will smuggle weapons, explosives and terrorist operatives into Gaza. Everything that Israel did was presented as motivated by a desire to torture, starve, humiliate and perpetrate a genocide on the Palestinians — as if there could be no other reason for these actions, no history of Palestinian (and particularly Hamas) terrorism against Israel, no need for security measures. I asked how they — Jews themselves — came to adopt the Palestinian cause. Donna told me that she had lived some time in Israel and was shocked by the racist attitudes of Jews toward Arabs. Palestinians, she said, were different, they were not racists, not full of hatred, they were reacting in the only way an oppressed people can. Not racists? Tell it to the ones who yelled itbach al yahud [slaughter the Jews] when they lynched the Israeli reservists who got lost in Ramallah in 2001. Not full of hatred? What else can you call it when you swing an ax at an Israeli child because he is an Israeli (or a Jew)? A local rabbi spoke for about one minute — while a Palestinian woman tried to shout him down — and asked whether they would have supported the 1947 UN partition resolution. Should there be a Jewish state at all? Apparently it is not only in Fresno where Unitarian Universalist churches provide a venue for radical anti-Israel and even antisemitic expression. See this report by BlueTruth about the Berkeley Fellowship of Unitarian Universalists for an even worse example. This entry was posted on Sunday, May 31st, 2009 at 8:44 pm and is filed under Local interest. You can follow any responses to this entry through the RSS 2.0 feed. Both comments and pings are currently closed. What is there to say except that Darlene and Donna are abominations. I commend Vic Rosenthal for his courage in taking on these kinds of haters in an atmosphere and surrounding where he has little support. If there is a lowest circle of Hell certainly the Darlenes and Donnas should have a place there. No courage required. The Unitarians and the Peace Fresno types are pleasant, harmless people — who for the most part have no idea who they are being used by. I hope they read the Hamas Covenant and pay close attention to it.